The information and advice given in this book are not intended as a substitute to consulting a qualified health professional. If you have high blood pressure, are overweight, have preexisting injuries to the spine or joints, you should consult a qualified physician or chiropractor before doing yoga. If you have unresolved emotional issues, consult with a qualified therapist. The publisher and author are not responsible for any adverse effects or consequences for the use of any of the suggestions or exercises in this book. This book, the video, and the CD are dedicated to Yogi Bhajan Ph.D., my teacher and the Master of Kundalini Yoga and my loving father, Chip. Nirvair Kaur Khalsa for steady and unwavering inspiration. Siri Pritam Bhagvati Kaur Khalsa for wonderful enthusiasm. Har Rai Singh Khalsa for his faith in the Universe and belief in me. Dr. Wahe Guru Singh Khalsa and Dr. Guru Sahay Singh Khalsa for being magnificent healers. Sat Kirpal Kaur Khalsa, Nirvair Kaur Khalsa and Bonnie Morris for kind and conscientious editing. Libby Roderick for the heart centered music. Amanda Brannon for all the beautiful cover designs. I know that intention combined with the power of prayer can work miracles. It is my intention with this system of “Heal your Back Now” to help and guide you to radiant well being. This book is designed to give you an overview of the system and to give you a specific plan of action to follow on your path of wellness. The video is designed to help you with recovery and the maintenance of a healthy back. A healthy back has always been in the forefront of my consciousness. The reason being is that my Dad had a ‘bad’ back. I remember very clearly as a child that he sometimes had to crawl up our stairs at home to go to bed. The doctors he saw finally gave him what amounted to a full trunk cast. It was a hot and bulky contraption that laced shut. It looked like a cross between a turtle’s shell and an old fashioned lady’s corset. I would help him occasionally by pulling on the laces that closed the cast and enabled him to stand upright and relieve the pain. His back became “bad” in the 50’s. If ever there was a misnomer for a physical condition it is the phrase “bad back.” I do acknowledge that although no condition can be essentially good or bad, it certainly felt bad to my father. His injury was the result of an abuse through over use. Most nagging back problems, on a purely physical level, that are not congenital or caused by traumatic accidents, are from abuse from overuse or under use. My cousin, who was in the Navy at the time, visited my parents in Chicago. While he was visiting he was stricken with Polio and his short visit turned into a year long stay. As my parents lived in a third floor apartment with no elevator, my father would carry my adult cousin up and down the three flights of stairs regularly. It compressed and initiated the destruction of several of his lumbar vertebral discs. Eventually he had a spinal fusion operation that helped him enormously. It was new procedure in 1959 and they told him that they really did not know if he would ever walk again. The operation was a success and he resumed an active lifestyle. I always accepted these stories on face value as the facts behind my dad’s back problem. It wasn’t until I began to study yoga and meditation that I realized that there was likely something more going on. The real question, I realized, was not “how” it happened but “why” it happened. Ten years later after my dad’s operation I started to practice yoga and meditation. I met my teacher, Yogi Bhajan, who is the Master of Kundalini Yoga. My immersion in the study of the subtleties of the body, mind, and emotions has led me to some wonderful conclusions about the back and health and well being in general. Teaching Kundalini Yoga to thousands of students since 1975 at the University of Alaska Anchorage, has confirmed what I know. Kundalini Yoga is an incredible tool for maintaining back health. 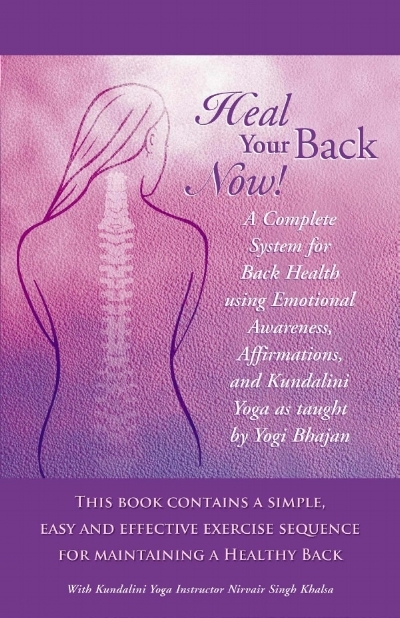 My prayer is that the information and exercises in this book and on the DVD/video “Heal Your Back Now!,” and the mantra/ music on the CD will serve you and your back well. Why do I have a back problem? This is the real question and it deals with you on all levels of existence and consciousness. It involves not just the physical spine and its surrounding muscles and ligaments but your mental, emotional, and spiritual self as well. There is nothing more debilitating and frustrating than back discomfort. It is a mixed bag of physical infirmity, pain management, and emotional discomfort. Nothing that I know of gets your attention more and as quickly as having a problem with your back. By a “problem” with your back I mean some kind of muscular discomfort or soreness usually accompanied by the mis-alignment of one of the spinal vertebrae, discs, or an injured ligament. It can be a minor condition, a congenital condition, or a reoccurring and chronic condition. Most non-trauma induced back conditions are not caused by a single action. People naturally think that when they reached for that cup or put on their sock or lifted that small object in an awkward manner that this was the cause of the condition. It almost seems like a betrayal. After all, I have put my socks on for years with no pain! The mental and emotional element surfaces at this juncture. “Why me and why now?” Any time the back has pain it seems inconvenient and somehow unfair. More accurately, the offending motion was the catalyst for the condition rather than the cause. The condition is usually a culmination of a variety of factors. These factors include habitual posture and body alignment, psychological profile, level of stress, kind of clothing they are wearing, and the kinds of exercise they are doing or not doing. The exception to this can occur during extreme physical activities such as heavy lifting or contact sports. Any sharp and sudden pains or pain that happens in the immediate days after extreme activities needs the immediate attention of a qualified health professional. I am an enthusiastic proponent of correct lifting and correct body alignment when doing physical tasks. It all boils down to physical habits. First of all, you create the habit and then the habit creates you! When students tell me they have been having back pain I usually start with these questions: Where is the pain? When did it start? How long have you had it? Pain sometimes can be “referred,” so after the three basic questions I ask something about their lifestyle and habits. Usually I am able to determine a physical habit pattern that they are unaware that they are doing. In my many years of teaching I have run into some reoccurring questions and physical patterns. Here are some of the common comments I get during a semester at the University Of Alaska Anchorage. I usually ask at this point if the pain started before or after school started. It is usually after school started and has to do with how they carry their book bags or purses. It is fashionable to carry the books on one shoulder which causes the imbalance of the muscles and pain. It is always best to carry loads evenly on the back in a backpack. Make your purse lighter or smaller as well and alternate which shoulder you carry it on. If it is a man I will ask him how he carries his wallet. Oftentimes, men will carry their wallets in their hip pockets. This causes the hips to be out of alignment every time they sit in a chair or drive their cars. Carrying the wallet in the front pant’s pocket or shirt pocket can eliminate the irritation. I will ask both men and women if they are the primary care giver for a small child in their house. Mothers and fathers and grandmothers and grandfathers love to carry a small child on their offhand hip so they can tend the child and work at the same time. Toddlers especially love to get picked up and carried so they can participate in what ever the mom or dad are doing. This unbalanced load can cause a problem in the lower back. If they cannot stop this habit, I will suggest that they systematically switch hips. Clothing can be a factor as well. High heels go in and out of fashion. When heels are in fashion, there are always more complaints about lower back pain and referred neck pain. Very low or flat heels are much better for keeping the back in alignment. The real solution to the physical part of this problem lies in working with three specific areas of the body. To maintain a healthy lower back you must stretch the life nerve (hamstrings), build the strength of the third Chakra, which is an energy center, through abdominal strengthening, and move the back in a variety of ways. The video in this system, “Heal Your Back Now!”, will show you how to work these three very important areas of the body. The first thing I will ask is if they work on a computer regularly. Recently a whole raft of new chronic injuries have happened because people spend so much time working and playing on the computer. The bio-mechanics of working in front of a CRT are very important. A good chair, a mouse pad, and keyboard with wrist support are critical. Taking care of yourself during the time you work is equally critical. The nature of computing is fascinating. In effect, as you stare into that screen, your mind gets pulled into a state of seemingly infinite information. People that surf the net sometimes get so involved that time disappears! The body is forgotten and sometimes “frozen” in place. You forget to move your body and a lot of shoulder and neck tension can result. It is good to take regular breaks from computing. Every fifteen or twenty minutes get up and move around, stretch, drink water, and roll the shoulders and neck. The next question I ask usually has to do with caffeine intake. When students are under the stress of deadlines, usually caffeine intake goes way up. More stimulation of the nervous system often has the opposite effect of what is desired. Central to the practice of Kundalini Yoga is the idea that in order to have a lot of energy you have to allow the body to be in a relaxed state so that the flow of energy does not get stuck or blocked. More caffeine usually leads to more stress and uncomfortable necks and shoulders. The real key to unlocking the shoulders and neck and having them in a state of constant physical relaxation lies in working various muscle groups in the lower back ( this can be the root cause of the problem), upper back, chest, shoulders and neck in a “tension and then release” method. In the video in this system, “Heal Your Back Now!,” you will learn how to work with all these parts of the body. These common problems are a small representation of what causes non-traumatic back problems. On a purely physical level, back problems are caused by abuse through under use or overuse. Certainly you can overuse your back like my dad or like a steel worker carrying heavy loads day in and day out. However,st of us do not use our backs enough. Especially as we get older, our range of activities becomes quite narrow. We get up, sit in a chair and have breakfast, sit in a chair in our cars or on the bus going to work, and then sit in a chair at work all day! After work is done we get back in the car chair, go home and then sit in our favorite chair reading or watching TV. If we are not sedentary, we may have a favorite form of exercise. It may be playing a sport, walking, running, or aerobics but usually we only have time for one kind of activity. The body was designed for a variety of activities. Children will rarely complain about non- traumatic back pain because they are moving all the time. Tell a child to sit in a chair. In thirty seconds you will also have to tell them to quit wiggling! Walking is one of the best activities for the whole body but you also need to dance, you need to stretch and you need to do new and fun physical activities all the time. Kundalini Yoga is great for the back. My experience has shown me that it is particularly effective for congenital curvatures of the spine. In Kundalini Yoga we spend a lot of time working with the flexibility of the spine. We move the whole back in many different ways that you don’t normally do in adult life. We use static stretching, range of motion movements, and also move energy through the spine. In addition, we work on the energy fields and learn and practice meditation techniques that clear and clarify the mind and emotions. The net result is a healthy and pain free back as well as the means to keep it that way! We know that the mind and the body are connected. When this really is apparent is when you have pain. Pain is the single most frustrating condition that patients and doctors have to deal with. It is physical and nonphysical, it is real and imagined, it is affected by moods and emotional states, and it does not respond reliably to any kind of treatment or medicine. Chronic pain, in particular, is difficult to handle in that it is a self -perpetuating mechanism in the nervous system. There have been recent studies that indicate that bed rest and pain killers do not shorten the amount of recovery time after a back problem. However, chiropractic adjustment can shorten recovery time. Acupuncture, massage, and hot and cold therapy have also been shown to be effective. Sometimes normal physical activity with treatment is best. If this is followed by an exercise routine to strengthen and stretch the back, reoccurring back problems are less likely to happen. In any event, pain is not to be ignored. It is your body giving you a message so that you will take care of an injury and, more importantly that you maintain a high level of sensitivity. When you make it a habit to ignore pain on a physical or emotional level, you are desensitizing yourself to part of you that is very important on a spiritual level. This quality of sensitivity is very evident in the lives of children. Children will let you, and the whole world, know when they are uncomfortable. What is known is that the pain/aversion cycle is a very important part of their learning process. Hot stoves and small hands rarely make contact more than once. What is not commonly known is that the quality of a strong reaction to discomfort is a healthy reflection of their innocence and vulnerability. We know that children are vulnerable and need protection. A child will use this quality and create a field of energy based on trust and abundance. It is their operating system in the world. They will get their needs fulfilled by this field of energy and the projection that they cannot do everything for themselves. It is always unfortunate when a child has to fulfill her own needs too early, or even worse, fulfill parental needs. They are not only short changed on childhood but lose that essential trusting nature. act independently. We are connected to every living creature, the earth and to unseen forces that we can never understand. This makes us dependent on each other and the on the large cosmic movements of time and change. The realization of your vulnerability and dependence, and growing comfortable with that realization, is a great strength. It comes from being childlike in this sense: you are able to honestly live in the present moment and acknowledge your feelings and sensitivity. When we get out of balance with our true nature is when we experience pain. This is why it is so important to consider all parts of our selves when we deal with back problems. It is a physical condition and it needs to be treated physically. It is also an emotional condition so emotional issues of the past and present need to be addressed. It is a spiritual condition in that the flow and deep connection to self need to be established and renewed for recovery. If you have an injured back, the first thing to do is to go see a qualified health professional for an assessment and treatment of your condition. Pain needs to be listened to and not ignored. This book and the video that accompany this book are intended as an adjunct to treatment and not a substitute for it. I use a chiropractor and a licensed massage therapist myself and recommend them regularly to my students. Read the text several times and then read the affirmations. You may not understand or agree with the text for each vertebra but read it anyway with as little judgment as possible. As your treatment progresses with your doctor practice the affirmations daily. Recite them to yourself mentally, in a whisper, and then out loud several times on awakening. Right before you go to bed at night start by reciting them out loud, then in a whisper, then silently mentally to yourself. Reciting them to yourself during your normal workday is useful as well. Write them down and put them in the bathroom next to your mirror. This way you can remind yourself to recite them in the morning and at night. Pick a meditation. I have made some suggestions at the end of the text on each vertebra. Realize that in any process of healing you are working with your whole self and not just your physical self. The meditations are included so that you can address issues and get help in a super conscious or etheric way. Meditation not only has a clearing effect on the subconscious mind and emotions but it works in your energy fields as well. The descriptions of the meditations are toward the end of this book. The meditation that you pick is really up to you. I have recommended certain meditations for different regions of the back but I urge you to practice each one and determine which one helps you the most. If you cannot decide on any of the meditations, use the mantra/music on the CD as a means of meditation. I also urge you to listen to the music on the video and the CD. You can order additional audio tapes and CD’s of mantra/music from Ancient Healing Ways 39 Shady Lane Espanola NM 87532 (phone number 505 753 0763) or Spirit Voyage 888 735 4800. The music/ mantra on the CD that is part of this system is a meditation in itself. Play the music during your healing process as much as possible. Play it at home, in your car, and at work if possible It will be especially effective at night. Play it in your bedroom all night long in repeat mode on your CD player. This way you create an entire nurturing and healing field of energy around you. 1. Visit your MD, Chiropractor or health professional for an assessment and treatment. 2. Read the text in the book that relates to the region of the problem and the specific vertebra. 4. 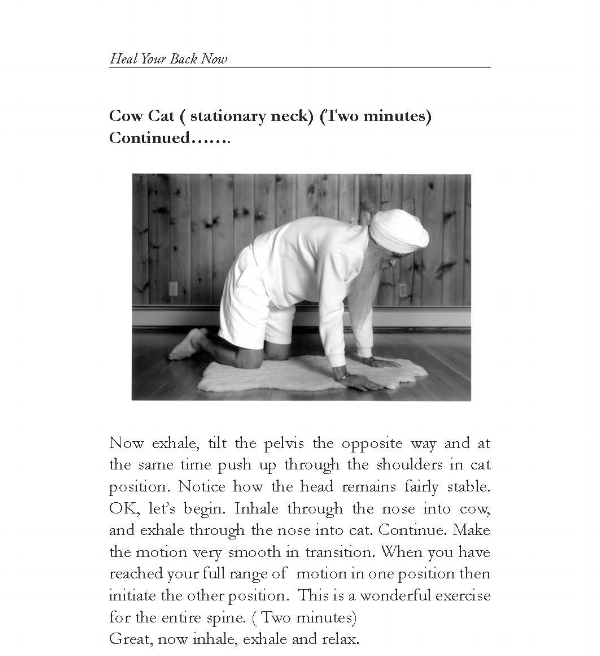 With permission from your doctor, do the “Heal your Back Now!” exercise series in the book and/ or DVD/ video. 5. Pick a meditation and do it daily. 6. Listen to the CD as much as possible, day and night. Consciously meditate on it daily. 7. After your healing crises has passed, practice the yoga maintenance exercise series, that is on the video and in the book, on a regular basis as a means of prevention. The nature of healing is a unique process that usually involves four little understood concepts. The first is: the body heals itself. The second is: the body itself has an intelligence and knows what it wants. The third is: actual healing supersedes the notion of time. The fourth is: the process of healing is beyond judgment; it is neither good nor bad. It is important to understand these concepts because they will expand your perception of the healing process and bring you to an understanding of the mind/body connection. This understanding can allow the methods in this book and on this video to be very effective. Understanding yourself and taking control of your own healing process is the true path of wellness. Many times in my yoga classes, I have seen students make breakthroughs by practicing similar techniques. It not only can happen, but it does happen! Sometimes the results seem miraculous. Here are the four concepts. 1. The body heals itself. What ever the medium of exchange or catalyst initiating the healing process, it is the body doing the healing. The catalyst can be allopathic medicine, herbs, homeopathic, physical adjustment, or manipulation, laying on of hands or mental/emotional realignment. It can be any of hundreds of traditional or alternative methods. In essence, some kind of energy is exchanged, and the physiological process takes place. We often mistake the medicine or the healer for the cure when it is truly a Self-initiated process that allows the body to heal. 2. The body has an intelligence and knows what it wants. This is the reason why a person is attracted to a certain healing modality or healer. It is the reason that an attuned person is attracted to certain foods and tastes. There is always a reason and that reason may or may not be reasonable. A more conscious and sensitive awareness of what the body is actually asking for can be developed with practice over time. Kundalini Yoga, meditation, mindfulness, and actively listening to your body will create a capacity of inner knowing and the confidence that the intelligence of the body and the intuition are in synchrony. 3. The healing process supersedes the notion of time. Healing doesn’t carry a watch. The old adage, “ It takes two weeks to cure a cold and if your lucky fourteen days,” is quite false. I have had colds for 15 minutes. This is the mechanism of miracles. When spontaneous healing occurs everyone is amazed. Our expectations and our notions of time measurements are exploded. When in actuality, it is just that the amount of for the healing to take place has been dramatically reduced. As a result, our perception of what has happened has been altered and the change short circuits our time- oriented rational mind. Hence a “miracle” is created. It is also why a modality of healing can take more time as well. We want the quick results but sometimes it takes more time. In herbal medicine it is very common for the effects to build and accumulate over a period of time. When an agent is introduced to a closed system as a catalyst, then the reaction can take many steps (and more time) to occur. Once again, time is not a factor in the large scheme of things. Even if it does take more time, the moment of healing happens in a moment. The actual “turning of the corner” is a spontaneous event, no matter how much time it took to get to that point in time. Moving beyond judgment creates two important faculties. The first is that it will cause a pause. When you question what is happening on the surface, when you realize that all is not what it seems to be, you must stop and consider. Sometimes these pauses can last a very long time. This is good; in that instead of embarking on your usual course of action, you must consider all the options and discover some new options before you act. Usually people come to this place after failing to get the results they want from their healers and healing modalities. These temporary setbacks are an invaluable part of the learning process. One of my favorite expressions is “when you do not know what to do, do nothing.” Siddartha (Buddha) said that “no matter what happens, I can think, fast, and wait.” While you’re waiting, do some investigation and discover different ways to approach your healing process. The second faculty is an exalted state of meditative consciousness called Neutral Mind. “Nothing is good or bad, thinking makes it so.” Meditative mind or Neutral Mind allows the rational mind to take a rest and the intuitive mind to take a turn. The intuitive part of you knows far more than you can consciously grasp. It lets you know the consequence of any sequence you initiate. It lets you know what to do and more importantly when to do it. All successful endeavors are governed by good timing. The meditations in this book can help you develop this faculty as well as connect you to your higher exalted self. It is important to notice that when you invoke a healing crisis it is a wonderful opportunity to learn about yourself and to heal on many different levels. Invoking a healing crisis may imply that you have done something painful to yourself in an intentional way. When it comes down to it, whether your crisis is conscious or unconscious, intentional or unintentional, it really does not matter. It is your process, and how you deal with it has the most personal relevance. Self forgiveness is a wonderful trait to cultivate. It will help you embark on what is really a learning and growing experience. If you are interested in this topic and would like to study it further, I have produced three videos to help develop your capacity and strength as a healer. The are called “Relaxing into the Deeper Mysteries,” “Building your Strength as a Healer” and “Healing Yourself and Others.” Request a brochure at www.KundaliniYoga.net. Here are a few suggestions of supplements that I have personally used with great success. Investigate them with the aid of your MD, Naturopath, or Chiropractor. Use their recommendations for dosages. This homeopathic remedy is wonderful for muscular fatigue, soreness, and injury. This remedy from the South Pacific works on relieving anxiety without sacrificing alertness. It is also good for muscular spasms and muscular tension. This spice is an anti-inflammatory and is a traditional yogic treatment for stiff and inflexible joints and spines. All the antioxidants are great for augmenting healing processes. OPC’s (grape seed extract) can help with pain and cramping associated with poor blood circulation by vascular strengthening. Ginkgo Biloba has also been shown to increase blood flow. These work well in combination for osteoarthritis, and are reported to have been used successfully to reduce or replace NSAIDS and other pain killers like aspirin and ibuprofen. Debilitating back problems can be depressing. This herb has been used in Germany extensively for mid to moderate depression and anxiety. This adaptogenic herb works well as a preventative measure for fatigue as well as a tool for recovering from long term stress and illness. The magic in this method of “Heal your Back Now!” lies in the spiritual and psychological/emotional self-assessment that you do by reading the text for each vertebra. The text is an edited compilation of information that came from Narayan-Singh Khalsa Ph.D. I had read some quick takes on the spine in a book that he had written called “Illnesses and Ailments (Messages from the Body).” We sat down and had a long talk about this information. Sometimes Narayan would read his own text and then elaborate further. We came up with these affirmations to help in the rebalancing process. Narayan-Singh is a gifted teacher, counselor, and analyst of dysfunctional patterns. His book, “Illnesses and Ailments (Messages from the Body),” has helped me understand a variety of illnesses that I have encountered in myself, friends, students, and families. I recommend it. It is astounding to me how much it can help you when you read about the dysfunctional emotional pattern behind an illness. Narayan-Singh says “the kid in us gets it.” In other words on some deep basic level, you come to understand what he says and it changes you. How he says it is quite unique. He uses a kind of “hip” shorthand that people can understand without lengthy explanations. My interpretation as to how it works has more to do with a personal spiritual knowledge of how my inner balance changes and shifts. It shifts according to outside input and my inner process. When I am off center and out of balance, I have found that I have to allow the direction I am going before some internal mechanism allows me to swing back to center. The outside input, in this case, comes from reading the text. It is also helpful to know, during these times, that my soul is in charge of my well being. In truth, my soul is the driver and my emotions and mind are along for the ride (liberally giving input, I might add!) I have included affirmations for each vertebra that directly involve your higher self or soul. Reading the text for the vertebrae can have an amazing impact. It sets in motion an inner understanding of the hidden emotional issue that you then can use on a deep level to rebalance your self. Narayan-Singh’s idea is that the emotional body is the translation point between the cosmos and the body. It is the connection point between the sacred and the physical realm. It provides us with selection criteria (as in “Oh my God, I don’t need that!” or “Oh yeah, let me have that!”) and other more refined distinctions of that sort. It also is the mechanism whereby our emotional reactions occur in response to the implications, the ramifications, the meaning (for lack of a better term) of whatever the event is we’re having the emotional reaction to. Connecting the physical event and discomfort with a psychological meaning can open inner connections to your own emotional responses and further expand your awareness of your natural overall connection to mind, body, and spirit. It, in effect, gives you permission to realize yourself as the holistic creature you truly are. The text may seem outrageous to you. I have strong reactions whenever I read Narayan-Singh’s analysis. You can learn something interesting about yourself just by observing your reaction to what you have read. Your reaction may be one of amusement, denial, anger, confusion, depression, “bell ringing,” recognition, enlightenment, or any number of responses. Please note that the descriptions are generic and extreme in nature and certainly don’t account for an individual’s successes or failures in dealing with the issues at hand. I urge you to just read it and then go to the affirmations and the suggested meditations. Affirmations are repeated reminders that become internalized with usage. They are designed to bring you out of the past and out of the future into the present moment in a newly balanced state of being. The next section of the book is an overview of each region of the back and the psychological and emotional meaning of pains or imbalances in these generalized areas. A list of the affirmations for each vertebra in this region is included also. This can be helpful when you want a quick overview of the area. It is also a somewhat gentler approach to the emotional patterns involved than can be found in the vertebra by vertebra text. It is also a great shortcut to the corresponding affirmations once you have read about the specific pattern. I recommend that you use the information and affirmations for the generalized areas of neck, middle back and lower back. Symptoms of pain or imbalance in this area would indicate that these persons are being confronted with issues which they haven’t been able to handle over a very long period of time. They must now finally be handled. Unfortunately, however, they are reacting by being stubbornly and rigidly inflexible, and by refusing to see other sides of a question. They can’t see what’s not in front of their nose or what’s behind things or in the background. They have clamped down on the system and they are adamantly controlling everything. They have lost almost all poise and fluidity and seemingly lost contact with their feelings. They have difficulty integrating and translating feelings and impulses into thoughts, words, concepts, strategies, and tactics. Life is stressful and a gigantic pain in the neck for them. They fear death, disaster, dishonor, disgrace, misery, illness, misfortune, and failure if they take risks outside of their known systems. They may be in pursuit of achievement in extreme ways that they regard as representing strength of character. They tend to be intensely method-oriented, form-fixated, and locked into their perspective. They can be very set in their ways, and they operate out of a morally convinced reactionary intolerance. Imbalances in this area indicates that a connection with their Higher Self or soul needs to be consciously pursued. These individuals can become very successful and balanced in their perspectives by making this connection. C:1 I trust my soul. I am naturally gifted and accomplished. I accept myself and my successes. C:2 My soul allows me to grow. The world is enhanced by my sharing. I can share my wisdom with the world safely. I can speak my mind safely. The world needs my knowledge. C:3 My soul creates good decisions for me. I am self responsible and free to be myself. I create in joy. C:4 My soul allows me to share my understanding with ease. My greatest gift is my understanding. I feel free to express myself. My emotional response to things is an accurate reading of what’s happening. C:5 My soul is good. I recognize what I know and I recognize that I know. I accept and trust my intuition. C:6 My soul allows me to release all resistance. I lovingly care for myself. C:7 My soul allows me to reach out to others with love. I am now experiencing life in which everything makes sense. I am surrounded with God’s love and abundance.I have a right to be me. The middle back region of the body contains the heart, lungs, esophagus, and diaphragm; everything that affects the heart is stored here. It is a very sensitively tuned response system which contains a person’s evaluations of their intentions to act, and the response to how they have acted. The trouble that develops in this part of the back indicates a fear of trouble from their environment. A person may say to themselves, “How will the world react to me?” It may reflect catastrophic expectations, stored guilt over past actions, reactions, and the unconscious feeling of getting stuck in all those scenarios from the past. This leads to “get off my back” feelings. It involves fear of going forward and being trapped in the past. Another response can be an anxiety about coping skills. “Do I have what it takes to handle the demands of life?” kinds of feelings reflect survival issues, therefore, there may be fears about what might happen. Heart centered issues also affect this region profoundly. Questions like, “How much should I give?, Can I give when I don’t feel like I can give? Do I know how to receive positive feedback and love when it comes my way?” are stored in the mid-back region. Because of the relationship to the heart center in this region of the back, these individuals can make wonderful progress by pursuing a path of self-love and forgiveness. Self-love can be defined as the strength to decide, on you own, what is good for you. Opening the heart through a balanced spiritual path that fosters loving self-reliance will help these individuals with all the emotional issues that are related to this region of the back. T:2 I love my soul of inner peace.I love m I trust myself. I love my inner tranquility. It is safe to love. T:3 My soul nourishes me. I forgive myself in love. I have a right to be me. I am a good person. I have a right to my feelings, positive and negative. T:4 My soul allows life to all. I reach out with love. I reach out with forgiveness. Everybody has a right to exist. T:5 My soul allows my life to flow. My reactions to things tell me what is real. My experience of things is truth. My body has its own wisdom. T:6 My soul allows my life to unfold gracefully. I have faith and confidence in my future. I am secure, and my future is secure. I can advance toward knowing that what is right for me will come to me. T:7 My soul allows sweetness to fill me. The world has become a loving and abundant place. T:8 My soul supports me all the time. I have the right to be me. I am totally acceptable in God’s eyes. I am what I am and that’s all that I am. I am above the norm. T:9 My souls allows my own power. The flow of life supports me. It is now safe to be me. T:10 My soul allows me to give and receive in love. Life really works when I take charge. Life is more fun when I do it myself! T:11 My soul allows me to relate in love. It really works when I’m me. I am bright, beautiful, strong and kind. I am appreciated by all. T:12 My soul allows love to flow through me. The universe nourishes me and I thrive on it. I am sufficient and valuable as I am. This is the pivotal point for all body movements. It is their leverage fulcrum for strength and their anchoring area for action; the balance beam for the body. It is the foundation floor on which everything is built in the way of being in the world. The basic emotional support, financial sustenance and physical sustenance and sense of security are located here. When problems develop in this area, it may mean there is a an unequal exchange of power and energy, and a sense of things being out of harmony. This results in a feeling of injustice and or being overburdened and undersupported. Indeed, there can be a strong sense of insufficient support and considerable resentment over that. This can be either momentary or chronic. There can be a fear of money, financial failure and an insecurity over basic support. Symptoms in this area of the back would include feelings of self-doubt, competence anxiety and worth concerns; feelings of the lack of will and strength to overcome the obstacles they face. They can avoid success out of fear of abandonment built in during their early childhood. They feel at risk on the survival level because their home did not seem supportive enough. At the same time, they feel overloaded with excessive demands because this was the pattern in their childhood. This can be painful and heavy and can create the desire to want to run away or escape. At the same time they suppress a desire to attack. They, therefore, are into over control for fear of release of aggression and of the misuse and abuse of power. Early on they may have been given messages that they never commit to themselves or to anyone or anything outside the family. There can be a considerable amount of grief over the lack of basic support, both currently and in their childhood. Furthermore, symptoms in this area of the back would indicate they can feel over-responsible, self-condemning, depressed, and despairing. There is a significant need for nurturing being displayed with this area of imbalance. Seeking this nurturing is important to their recovery and development. Qualified spiritual guidance can help these individuals with the tools they need to become secure, supported and creative. L:1 My soul creates all I need for myself. I deserve love. What I am is acceptable to God. I am secure in the company of loving and accepting friends. L:2 My soul allows me to live in love. I am able to exceed all expectations. I find my way with ease. L:3 My soul allows my safety. I release past regrets. I love my creative force. I’m generous. L:4 My soul allows me to love who I am. I feel safe expressing my power. I’m worthy of being loved. I’m clean and good and I can go for the top. I love my healthy sexuality. L:5 My soul allows pleasure in my life. I love to enjoy my life. I’m now able to receive what I deserve. The war is over. Sacrum: My soul and creativity are beautiful. I am strong, stable and secure, yesterday, today, and tomorrow. I deserve love, affection, and sexual fulfillment. Coccyx: My soul allows balance in my life. I release and forgive the past. The universe is safe and loving. I am a beloved part of God’s creation. The following paragraphs explain the tendencies that are associated with any kind of symptoms of imbalance or pain associated with each vertebra. Please remember that these explanations are extreme examples of dysfunction. It may describe your condition imperfectly. However, it is very useful to read it and just let it be. Symptoms of imbalance or pain associated with this vertebra can indicate that these people may experience fear, confusion, ostracism, paranoia, fear of failure, running from life, and feeling not good enough. They have a fear of “What will the neighbors say?” There is endless inner chatter. They feel they are not able to experience divine support and input. These fears arose from an “associate parent” experience in which they were expected to become the parent at an early age. They had to perform to perfection to receive any level of validation, and were, therefore, basically in over their heads. They ended up being painfully conscious of the fact that they didn’t rise to the need. Of course, the reality was that they were in over their heads. The parents were asking them to reverse roles — to take on the role of being a parent — and they were just a child. So, the “What will the neighbors think?” theme comes down to the failure in the eyes of self and others. It comes from being placed in a position of much too much responsibility from much too much an early age. This is usually someone who is remarkably gifted and accomplished and who has risen to what can be called the “family emblem” phenomena. The trouble is that they have this underlying fear of failure arising from being over-loaded with responsibility too early. There is also guilt over the fact that all of this energy and these resources have been directed their way at the expense of the other family members. They feel guilty about this direction. They also can feel shame because of the fact that they have had to rise to the position of being the associate parent at a very early age. In other words, childhood lost. They were unable to have a childhood. It seemed a direct indication that they didn’t deserve to have a childhood. They, therefore, have a deep seated, unconscious reaction that needs healing. The key is getting through to them at the core of their being; that this whole process was in response to extraordinary giftedness on their part and extraordinary irresponsibility on the parent’s part. (This is not to be taken in a pejorative sort of way, although it helps at some point to get down and talk the from the child’s perspective. The child’s language includes blame throwing and acting out anger because that is what the child understands and needs to hear at this stage in the process. You can talk later about the circumstances and the family patterns that precipitated the parents’ neurosis and explain how all of that came about.) The key for the child is that he has to understand this whole process was a function of the environment’s response to their gifts in the first place, instead of some sort of karmic disaster that they have brought in to this life with them. The key is shame/guilt alleviation. In order to deal with this, self-questioning is really necessary. The deep question is the big WHY? Why did this happen? They think there is something wrong with them — bottom line — so the task is (and they love tasks because they are such achievers anyway) for them to get into drawings or story writing or self-guided imagery, or meditation. They can use these techniques to get into the parent’s space and the parent’s response to this rather radiant being coming in to their lives. They can reconstruct the circumstances, as best as they can put it together, of what the parents were going through at the time. They can become the parents, so that they can experience how it was that all of the things happened to them the way they did. It also needs to be emphasized that the whole situation was the parents’ responsibility. Achieving a connection with the guiding principle of the Higher Self or soul will help these individuals accept their gifts in life. Affirmation: I trust my soul. I am naturally gifted and accomplished. I accept myself and my successes. Symptoms of imbalance or pain in this vertebra may mean that these people are apt to reject wisdom, refuse to know or understand, and are indecisive. There can be intense resentfulness and the tendency to blame. It feels very dangerous to them to take a stand and make a decision and they are off balance with this and with life. They may feel shut down in connection the spiritual realm. They grew up with a family that could not handle the truth very well. The family would explode or blow up at the seams if the child expressed any understanding which required responsibility, accountability, or integrity. They have what you could characterize as “world destruction fantasy:” They feel that if they get in touch with the spiritual or the wisdom realm, they basically will destroy the people around them. It is called the dynamite shed effect — kind of feel around, light a match to see in order to see, and “POW”, destroy everything they know. That’s what happened in their learning history, so they’re deadly afraid of what would happen to the world around them if they express the wisdom that lurks within them. It is basically a fear of knowledge. They are literally afraid of causing destruction and that is a function of growing up with a family that could not handle the truth very well. The challenge here is that the early environment of these people was intolerant, whether it was an individual who had the normal kinds of perception that children have (walking radar), or an individual who came in with a lot of spiritual know-how, knowledge, or wisdom. It doesn’t matter what the issue was. There was a friction between the nature of the child and the level of tolerance that the family had with regard to the gifts the child was born with. So, the issue is fear of sharing what they know. This can, of course, be addressed by establishing environments where it is encouraged and safe to communicate their profound wisdom. Affirmation: My soul allows me to grow. The world is enhanced by my sharing. I can share my wisdom with the world safely. I can speak my mind safely. The world needs my knowledge. Symptoms of pain or an imbalance in this vertebra may indicate that these people have a damaged capacity to perceive spiritual truth as a means of self guidance. Instead, they accept blame for others. Guilt, martyrdom, indecisiveness, grinding one’s self down are traits they may exhibit. The family of origin was also afraid of losing them, so they basically try to undermine this individuals’ confidence so they won’t lose them. This person can feel that their only worth is in being there for others. Their perceived failure is that they can’t be there for others enough, and so they may become co-dependent servers. Developing self-responsibility, healthy relationships and their spiritual nature will be useful to these individuals. Affirmation: My soul creates good decisions for me. I am self responsible and free to be myself. I create in joy. Symptoms of pain or imbalance in this vertebra may indicate that these people have difficulty in seeing or knowing the inner-essence or truth of things. This is because they have seemingly lost contact with their Higher Self. They feel guilty about almost everything that goes wrong, as if they are somehow responsible. They, therefore, stuff their tears and suppress themselves; they have oppressive anger, bitterness, bottled up feelings. It is a kind of resigned bitterness over their perceived joyless and squelched condition. They are the product of a repressive and blame throwing early environment in which they were held accountable for all negative events, as if they had the power to control things magically. It resulted from being in a higher state of development, one way or another, than the family. When they turned to the family for care- taking and it didn’t work out well, the family blamed them. There was a “don’t feel” injunction and possibly a “keep on talking and don’t look in” mechanism. It was really about not communicating with their inner truth. These individuals are what you could characterize as an emotional body expert, and the family questioned and undermined their emotional competence and understanding. The family was somewhat “meaning avoiding” and rejected any emotional understandings or competence. They responded to this person’s emotional expressions as being unsavory and unacceptable. Simultaneously they needed these individuals to express a profound understanding of the family circumstances. This exploitation resulted in the negation of the child’s relation ship with their Higher Self. Cultivation and appreciation of their Higher Self or soul may help these individuals to regain their joy in life. My soul allows me to share my understanding with ease. My greatest gift is my understanding. I feel free to express myself. My emotional response to things is an accurate reading of what’s happening. Symptoms of pain or imbalance in this vertebra may indicate that these people have a very weakened capacity for getting the whole concept at once, for intuition and full comprehension. As a result, they have a fear of ridicule and self expression. They have great difficulty believing they have any good about them. They have communication problems and fear of making mistakes. school that he began to have some success and to believe that maybe he had some intelligence.) This is the same kind of phenomena. This is a person who has natural knowing; it could be anything — clairaudient, clairsentient, clairvoyant, intuitive — they know things and they can’t explain how they know them. The family got very freaked by that. These persons were asked every time they spoke from their knowing, “Exactly where did you get that answer?” So they ended up very afraid to make any kind of commentary. The underlying basis for this unfortunate relationship is that they never were taught or understood that intuitive hints, direct understanding, and natural knowing are gifts of God. Cultivating their intuitive side, combined with learning communication skills, may assist these individuals with their unique abilities of expression. I recognize what I know and I recognize that I know. I accept and trust my intuition. Symptoms of pain or imbalance in this vertebra may indicate that these people can be characterized by four words: That is not logical! It’s the walking cerebrum, control-freak type of persons. They may be over-burdened with responsibility from trying to “hands-on” handle everything from a rational, logical approach. This is living in the mental body and trying to impose it on everything; like a Mr. Spock. There is an overlap with the emotional competence issue from C-4. This issue primarily lies in these person’s total rejection of any emotional competence, whereas, in C-4, it was the family’s rejection of any emotional competence. More specifically this pattern can be the individual’s rejection of any emotional competence, or both their rejection and the family’s rejection of any emotional competence or understanding. Their history is one involving either their being in an emotionally chaotic family and retreating to the mental body to try to achieve order, or the family themselves refusing to have anything to do with anything but the mental and logical approach. In both cases, it is a hyper-rational, feeling-suppressing process. These ones live in their mental selves to the point where it is too extreme; they can’t be in their emotional self - competent state. They cannot empathize with “I don’t get it.” Their repression of feeling is not because of shaming from the family, but fear of feeling. It feels like it is out of control, irrational, illogical. It does not make sense or does not compute. They are trying to handle all of reality with their mental self. Now whether that is an emotional “inheritance,” (passed on from previous generations) or a current family culture acquired pattern, is an important difference. If it is an inherited pattern, then they are required to do some serious internal work with regard to accessing their emotional self competence and understanding. If it is a family culture pattern, then it is more of a tolerance issue towards other people and themselves regarding the emergence of the emotional self-competence. One suggestion is to get regular massage and a lot of good body work. It immediately activates the access mechanism to the emotional self and gets the energy moving again. My soul allows me to release all resistance. I lovingly care for myself. Symptoms of pain or imbalance in this vertebra may indicate that these people feel confusion, anger, helplessness; they can’t reach out. They may have a sense of persecution, a feeling of great struggle, hidden fears, a sense of being out-classed and overwhelmed by the world. The issue here is separation from the universe and their connection to their Higher Self. This is the “attic” vertebra. It feels like they are cut off from the Home Office (God), and from abundance. It feels like they are living in an untrustworthy universe. They may feel abandoned, and rejected. This comes from an early family setting in which nothing seemed to ever work. In addition, blame was thrown around all over the place and added to this feeling of abandonment. Underneath that feeling, arises the big question, WHY? The answer comes up, “You don’t deserve abundance or meaningful support in your life.” They feel deprived and they resent it, and at the same time they can’t figure out why they are in this situation because the family was so confusing. The issue, then, is one of ostracism or alienation. It is like a person without a country, which is the ultimate deprivation and rejection experience. The basic bottom line issue is that they feel that the universe doesn’t love them. It comes not so much from an attack on them personally; it comes from their being immersed in a crazy, chaotic, environment. They ended up with the feeling that since they are part of this scene, and since this scene is their concept of the universe, it means that they feel deprived and as a result ejected. They were cast out from that all that they see around them that makes sense, that works, that is abundant, that is loving and supporting. They believe somehow at some basic level, they deserve it. At the same time, they are resentful because they can’t put their finger on what it is they are or what it is they did. Like a lot of experiences in their life, no matter what they do nothing seems to work. It could be called an ongoing traumatic stress disorder. This, of course, can be resolved in a stable loving environment. A self-created environment that links success with feelings of inclusion and support can work wonders for building trust in the universe for these people. My soul allows me to reach out to others with love. I am now experiencing life in which everything makes sense. I am surrounded with God’s love and abundance. I have a right to be me. Symptoms of pain or imbalance in this vertebra may indicate that these people experience fear of life — it’s too much to cope with, they can’t handle it. They have a tendency to close off from life, are unable to keep faith and hope alive, and therefore, the tend to give up in despair and resignation. This was caused by being made responsible for an impossible situation. In their family of origin, often they were expected to make it all better and it was way too much for them to handle. In addition to being an overload for a child, it was virtually an impossible demand, so they ended up quite demoralized by the whole experience. Their whole experience of life, then, is that it is impossible to cope with and impossible to handle an overload of work. The issue here is coping capability. Two main issues come to light here. One of them is the issue of their coping capability and their whole sense of being insufficient to cope, and the other issue is life, or the environment, or the universe as being a sensible, totally manageable system. These people are basically demoralized in regard to both these issues. Their experience with their history is that they can neither cope, nor is the universe of a such a nature that they are able to cope. These are the relevant issues, “crazy world” and an “incompetent me.” Their sense of being demoralized by their personal history can be altered by coping with small manageable responsibilities and cultivating a relationship to the Higher Self or soul which will allow them to be open to the process of life and its’ demands. Symptoms of pain or imbalance in this vertebra may indicate that these people may have had to shut down their heart center due to fear, pain, and hurt. They don’t want to feel or be vulnerable, much less connect and merge. They may have difficulty loving themselves and feeling inner peace. They feel that love is a “poisoned apple.” This feeling affects their immune system by breaking it down from lack of self-love. They feel they have been betrayed right and left. I love my soul of inner peace. I love myself. I love my inner tranquility. It is safe to love. Symptoms of pain or imbalance in this vertebra may indicate that these people suffer from inner chaos and deep old hurts. There is difficulty talking about it because they have difficulty forgiving themselves and others. They may be blame oriented. Their early environment was filled with blame and judgments with the message, “You made your bed, now lie in it,” with the result they had to sit still and take it. There is a great deal of inner turmoil. It is a combination of outrage, despair, fear, guilt, shame and confusion, so that there is a tremendous internal churning of confusing negative emotions. My soul nourishes me. I forgive myself in love. I have a right to be me. I am a good person. I have a right to my feelings, positive and negative. Symptoms of pain or imbalance in this vertebra may indicate that these people feel there is not much joy or elation in life. They have little light in their life and they have lost the ability to have a sense of humor. There is a tendency toward bitterness, a need to blame and condemn, and a need to make other people wrong. For them, life is not much fun, and there is not much laughter. Their acquired distrust tends to dominate their environments. They feel that “Someone is to blame here and it sure isn’t me!” They are doing unto others what was done unto them — passing the blame and disgust. What is needed is the cultivation of tolerance. Tolerance is the real issue for oneself and others. It is important to remember that this pattern was learned in the early family environment and can be “unlearned” through a conscious habit of compassionate self-forgiveness. Cultivating a sense of humor is a necessary element with this pattern. My soul allows life to all. I reach out with love. I reach out with forgiveness. Everybody has a right to exist. I can laugh with myself and others. Symptoms of pain or imbalance in this vertebra may indicate that these people have a sense that everything will fall apart if they come in contact with their feelings. Therefore, there are loads of damned up feelings and, often, rage. It is all the result of growing up in an environment that suppressed feelings and avoided reality. An environment where it is safe to express their feelings must be cultivated so they can experience the security in the flow of reality. It may also help these individuals to look beyond their habitual pattern of perceiving a reality that results in frustration and anger and looking to an expanded spiritual view of what is real and true. My soul allows my life to flow. My reactions to things tell me what is real. My experience of things is truth. My body has its own wisdom. Symptoms of pain or imbalance in this vertebra may indicate that these people distrust themselves and the world, and they are in a constant state of fear and worry over the future. They may have little trust in the process of life, feeling that it is their fault, and that they don’t deserve to have things go right. They feel realistic anxiety about the future — “Where is next month’s rent coming from? How am I going to pay my wife’s medical bills. Am I going to be fired from my job?” They stuff these questions and the feelings that go with them, and this generates anger at life. They shove unacceptable feelings into the shadows and the unpleasant realities of life under the rug. As a result there is an experience of chaos and “magical misery tour” in which they never know what will go wrong next, just that it will. They are also forever on an armed guard vigil, which is a constant reminder that they don’t deserve to love themselves and trust in the unfolding of the future. This is a complicated one. They have a fear of the future, and little trust in the flow of life. They are kind of like a backfired Pollyanna. They try to do the “Smile! Everything is great!” kind of behavior and when it doesn’t work then everything falls apart. This creates anger that is compounded by denial. It is a three stage dynamic: they don’t trust things, they try to deny (it blows up in their face) and then they get angry which reinforces their distrust of the process of life. What is needed is a reverse approach in order to break this dynamic. Dealing with the anger is paramount, followed by the acknowledgment of their fears. This can create a “Rumpelstiltskin” effect: naming it causes it to disappear. Fears can be reduced and confidence restored. My soul allows my life to unfold gracefully. I have faith and confidence in my future. I am secure, and my future is secure. I can advance toward knowing that what is right for me will come to me. Symptoms of pain or imbalance in this vertebra may indicate that these people are feeling pain within themselves all the time. They are convinced that love is a “poisoned apple” that cannot be eaten, therefore, they refuse to enjoy life. They even seem to refuse love. Their bad feelings, pain, and grief are deposited inside, creating a difficult inner discomfort. They grew up in a manipulative, untrustworthy, extremely self-serving environment that seemed impossible to overcome. The only response they had or could have was to simply shut down and shut up. They’ve got a thick and transparent shield up based upon their early experience and perception of an untrustworthy environment. Opening themselves up by seeking trustworthy counsel is needed. This will help them to experience, first hand, that they are acceptable and they can enjoy the support and abundance that life has to offer. My soul allows sweetness to fill me. The world has become a loving and abundant place. Symptoms of pain or imbalance in this vertebra may indicate that these people are obsessed with failure and resist their own good at every turn. They do not let much love, joy, and abundance in and can avoid success. Deep inside is the feeling that the universe will punish them if there is success or quality in their life. There may be much unhappiness. The fear is that there is something bad about them that they either did before in another time of life or that they are inherently manifesting in this life. They feel that if any positive thing comes to them, the universe will annihilate them — literally. In other words, their experience is that since they are so bad, they deserve almost nothing but bad. They feel that they have almost no right to any kind of positiveness. They received this painful message from the family. The family’s message was, “If it weren’t for you, we’d all be happy.” This makes them believe they deserve only the worst. The issue is one of having to work on their “self as monster” perception. The monster feeling can rise from the family being so overwhelmed that they literally got frightened of the individual and attacked these individuals with the messages of blame and shame. What ends up happening, then, is the family translates this gift of a child into some sort of monster. The issue here is to get the kid (the internal child) to recognize that the family’s reaction to him was their problem, not hers. They were the ones who took something that was beautiful and turned it into the grotesque. Individuals may have come into a family in which their nature was so far from the norm and the manifestation of the family that they were confronted for being gross, negative, and disastrous, when in fact what they are was quite the opposite. Building a sense of strength through a personal spiritual identity can provide these individuals with the acceptance they need to succeed in life. My soul supports me all the time. I have the right to be me. I am totally acceptable in God’s eyes. I am what I am and that’s all that I am. I am above the norm. Symptoms of pain or imbalance in this vertebra may indicate that these people feel like a victim in a world that lets people down. They feel let down by life and that it is someone else’s fault. They feel powerless, having no strength or capabilities to create their own life. They are a product of a family situation where nothing was as it seemed. So they found that they were able to fill the victim role in this situation and they are stuck in it now. It’s just that they have a lot of aggression as their only response as a function of their learning history. Often the response they get from life is when they do anything at all, it does not work to the extent that it seems to blow up in their face. Self-empowerment is the issue here. The two pieces are: 1) learning that the war is over; that the world does make sense, and therefore, it is sensible and worthwhile to develop their capacity to make things happen; and 2) the necessity of taking charge of their life. My souls allows my own power. The flow of life supports me. It is now safe to be me. Symptoms of pain or imbalance in this vertebra may indicate that these people refuse to take charge of their life. They would rather be a victim and blame someone else for their position in life. They feel that they don’t deserve the yummy good things in life, the positive things. They grew up in a family where responsibility taking was avoided and being accountable was never learned. There may be much sadness and sorrow with this state of mind. This person is a perennial child, like a Peter Pan, who never learned that when you allow yourself to grow up, you don’t have to go into one of the big negative life themes. What happens instead is your playground gets bigger. My soul allows me to give and receive in love. Life really works when I take charge. Life is more fun when I do it myself! Symptoms of pain or imbalance in this vertebra may indicate that these people have very low self image. They feel that they could never make it in any relationship and are generally fearful of relationships. They may have been told many times that they are unlovable and unfit for human contact by their family of origin. Working on self esteem is essential for these persons to have successful relationships. This is best accomplished by engaging in meaningful and personally interesting activities that these persons can feel accomplished and appreciated. These kinds of activities can then be shared with friends and relatives. My soul allows me to relate in love. It really works when I’m me. I am bright, beautiful, strong and kind. I am appreciated by all. Symptoms of pain or imbalance in this vertebra may indicate that these people are locked into deep insecurity and are fearful of love. They feel that love is a “poisoned apple” and joy is indigestible. In effect, they may have disowned the right to live in joy and love. In their insecurity, they believe that they got what they deserved and can expect no better out of life. They may feel there is something inherently incomplete or insufficient about them. Their belief that they are undeserving and can expect no better out of life, comes from a family who lived in a similar manner. They feel that there is something inherent in them that can’t assimilate anything positive, that they are only built to handle negatives. This, in turn, goes to a deeper assumption that there is something about them that requires a process of hiding out until they can safely emerge. They may feel like they are damaged goods and out of step with current circumstances. They have the opportunity to shift this tendency by cultivating a realization that the world supports love and values all existence. My soul allows love to flow through me. The universe nourishes me and I thrive on it. I am sufficient and valuable as I am. Symptoms of pain or imbalance in this vertebra may indicate that these people have a subtle, deep feeling that there is no support or love in the universe for them. They may have lots of insecurity, a crying out for love, and simultaneous need to be alone and lonely. They feel like they have been shipwrecked on a desert island for something they did, what they became, or what they are. The ambivalence comes from the fact that they feel they have to be alone, alienated, and lonely, yet at the same time feel that they are desperately in need of some sort of support and resources. It is a huge conflict. On the one hand, they feel they have to atone and, as a part of that atonement, they dare not get into loving support. On the other hand, as a basic human requirement, they have to look for loving support, and as a fundamental soul necessity, they know they are not alone. There is the reality, that no man is an island, so it creates this dilemma. They live out their situation of being alone and alien, but they have a deep conflict about it. Cultivating a sense of connection to friends and community may help these individuals experience the loving security that they truly deserve. |My soul creates all I need for myself. I deserve love. What I am is acceptable to God. I am secure in the company of loving and accepting friends. They have a distorted sense of loyalty and betrayal paranoia about ever living their own life. It goes beyond the quality of life for their parents, becoming the belief that if they have quality of life that is better than their parents’, they are betraying the parents. The issue is that they can’t exceed the success their parents, and the parents had a powerless and dreary lifestyle. Steps must be taken to secure the inherent goodness of life with these individuals. Quality of life (that can equal or exceed the parent’s lifestyle) naturally comes from experiencing self- nourishment and a self-empowered personal sovereignty. My soul allows me to live in love. I am able to exceed all expectations. Symptoms of pain or imbalance in this vertebra may indicate that these people may have been victims of sexual abuse and feel conflict and hatred as a result. They feel unsafe and can trust no one. They may have sexual shame, self-revulsion, and feel trapped in the past. Abuses may have occurred so early that the person may have taken it as their deserved treatment. Their deep distrust for the universe was cultivated at an early age; they may expect the universe to betray them again. They may have loads of regret, remorse, sexual tension and stubbornness. Sexuality and gender bonding are a very positive developmental stage, but may have been used abusively in their case. What that meant for the person was that they lost their balance and a positive development stage became negative. These individuals will benefit from a restoration of the balance of power in intimacy and realistic expectations in regard to their sexuality. This way they can begin to restore their trust in the present and release the past. My soul allows my safety. I release past regrets. I love my creative force. I’m generous. Symptoms of pain or imbalance in this vertebra may indicate that these people feel powerless. They may have difficulty with success in intimacy, sexuality, financial security, and career. They feel they do not have what it takes for success. They fear failure and mistakes when they try to take responsibility in career. They are usually the product of over-possessive parents who undermined their confidence and competence. The message from parents was, “You belong to us. You can’t make it in the world. Stay here.” Cultivating personal empowerment and individual spiritual sovereignty will go a long way for these individuals in establishing their secure place in the world and will help them with any and all challenging issues. My soul allows me to love who I am. I feel safe expressing my power. I’m worthy of being loved. |I’m clean and good and I can go for the top. I love my healthy sexuality. Symptoms of pain or imbalance in this vertebra can indicate that these people may feel undeserving, very insecure about their worth, and have difficulty communicating because of it. They may have a great deal of frustration, resentment, and rage about their isolated and insecure experience of life. Their early environment undermined their competence and confidence. They have little confidence and little sense of self- worth because the family environment, in a self-serving manner, exploited them. It happened so early that they ended up blaming themselves and feeling shame because they felt they could not do more or give more to the family. The early environment had little vitality and the family felt so overburdened with unresolved emotional issues that they not only did not support these individuals but relied on them to provide the vitality for the family. These individuals can overcome these tendencies by developing communication skills, and involving themselves in group activities that provide them with confidence, energy and joy. My soul allows pleasure in my life. I love to enjoy my life. I’m now able to receive what I deserve. The war is over. Symptoms of pain or imbalance in this vertebra may indicate that these people feel loss of power and long standing anger or rage over inappropriate early sexual training. They are likely to have sexual guilt because of the early environments giving mixed signals about the meaning of healthy sexuality. They may been made to feel bad for having sexual feelings. They were made to feel wrong for responding or not responding — so they were in a lose/lose situation. They felt powerless to do anything about their situation and at the same time enraged about how they were treated. They may be hanging on to the anger that this situation and training caused. Pain and imbalances in this vertebra can indicate an early sexual abuse pattern. It’s what can be called the seductive/destruction pattern. Whoever was doing the care-taking, in the significant parent position, may have misused their power in relation to these individuals. This undermined the child on a deep level and produced confusion and shameful feelings about their sexuality. Their personal sense of power can be restored by 1) learning how to release their anger and 2) cultivating their healthy sexuality. My soul and creativity are beautiful. I am strong, stable and secure, yesterday, today, and tomorrow. I deserve love, affection, and sexual fulfillment. Symptoms of pain or imbalance in this vertebra may indicate that these people are out of balance with themselves and holding on to self-blame for old pain. They tend to be compulsively conservative, hyper- cautious, anxious about survival, and have low self- love. They feel they don’t deserve safety and security. There may also be sexual shame. There was a fair amount of blame and shame induction in the early environment, particularly around sexual issues. There was also a considerable amount of generalized survival insecurity. Specifically, that the environment felt unsafe and that basic needs could not be met. If you breakdown this pattern, one part of it is sexual shame, another part is survival anxiety, and the third part is that they have little right to exist, feeling like they are rejected by the universe. These issues can be addressed by working on self-esteem and creating a firm base for themselves so that they feel safe and secure in the universe. A spiritually based esteem building program can provide a new foundation for these individuals to attain a sense of balance in the world and in life. My soul allows balance in my life. I release and forgive the past. The universe is safe and loving. I am a beloved part of God’s creation. As part of your healing process it is a good idea to pay attention to your soul or higher self. In actuality all the great triumphs and tragedies in your life are guided by your soul. You have come here to learn and your body is your best friend and learning partner! These meditations will bring you the blessing of connecting your entire healing process with your soul and higher self. Here is a brief description and instruction on using these meditations that will accelerate your healing process. Picking a meditation is entirely up to you. Read the comments and practice all of them until you find the one that you feel will help you the most. If you are injured, it is always a good idea to check with your qualified health professional before you do any physically oriented movements. 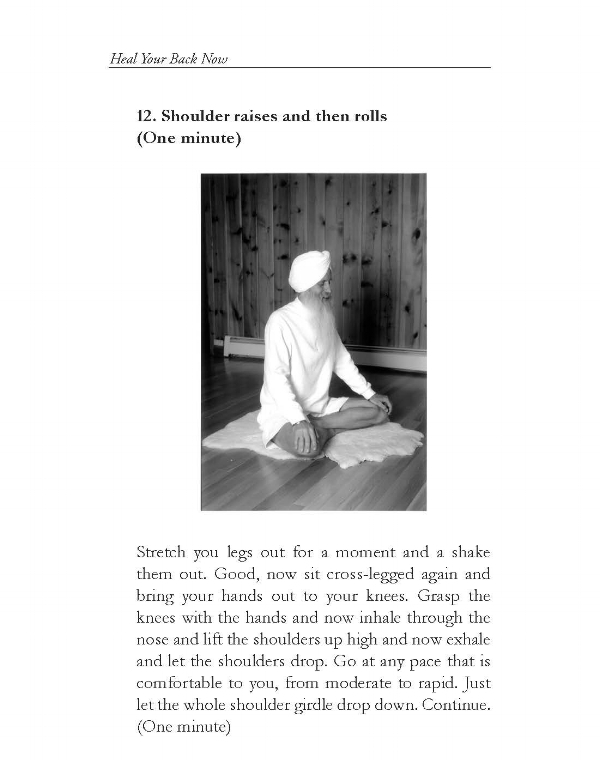 Note that the Mantra of Guru Ram Das, that is available in musical form on the CD, and the Silent Clearing Kriya require no physical movement whatsoever. Any simple mantra like “Sat Nam” or “I am” will help you keep your mental focus on the breath as you practice. Three to thirty -one minutes. Sit comfortably cross legged on the floor or sit upright in chair with both feet flat on the ground. Hands can be folded in the lap or in Gyan mudra ( index finger and thumb touching) with the arms straight and the edges of the hands at the knees. With the eyes gently closed and focused at the brow point, inhale through the nose and exhale the nose. Make the breath very smooth in transition, in other words do not hold the breath in or out. When the lungs are full, empty them and when the lungs are empty, fill them again. Your breath target rate is 4 to 6 complete breaths a minute. If you can slow the breath down even more with comfort, then that is wonderful. Inhale deeply and stretch the arms overhead, twist the body from side to side, and then shake the hands vigorously. Relax. This invaluable technique is the basic building block of all yogic breathing. It will calm you and sensitize your own self to your thoughts, your surroundings, and the natural flow of energies within and outside of the self. My video, that has instruction on long slow deep breathing, is called “Breathe Alaska.” Yogi Bhajan has commented that this technique, as taught on the “Breathe Alaska” video, is excellent for helping with digestive and blood disorders. 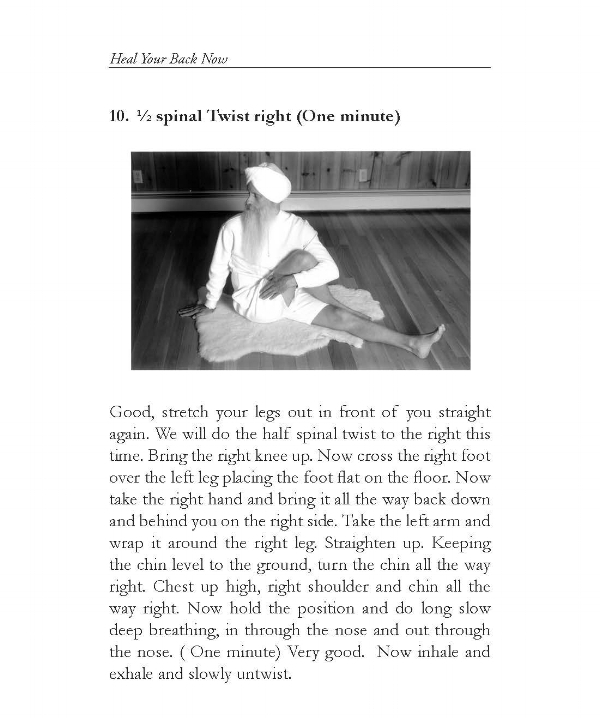 It is available online at www.KundaliniYoga.net. The video is a useful tool for learning and practicing this meditation. This meditation is beneficial for all three regions of the back. The ‘r’ in the first three sounds ( Har, Haray, Haree) almost sounds like a ‘d’. You flick your tongue up to the roof of the mouth. This is also true of the sound ‘r’ in Guru. Sit comfortably cross legged on the floor or sit upright in chair with both feet flat on the floor. Your hands can be folded in the lap or in Gyan mudra (index finger and thumb touching) with the arms straight and the edges of the hands at your knees. In a soft monotone, recite out loud each of the sounds at each Chakra ( energy center) starting at the navel point and working up to the crown of the head. Chant “Har” and concentrate mentally at the belly button. Chant “Haray” and concentrate mentally at your heart center (sternum). Chant “Haree” and mentally concentrate at your throat center (throat). Chant “Wahay” and mentally concentrate at your brow point (½ inch up from the eyebrows in the center of the forehead). Chant “Guru” and mentally concentrate at the top center of the head. Inhale deeply and stretch the arms overhead and the shake the hands vigorously. 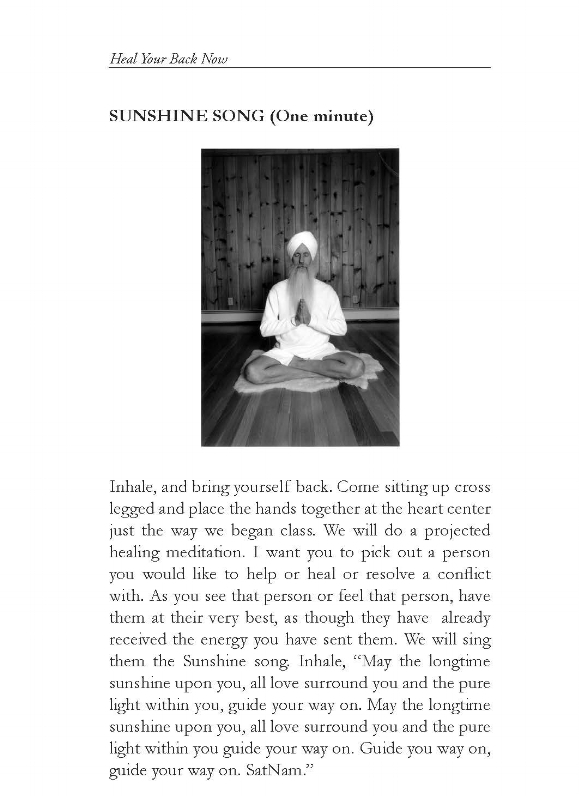 Yogi Bhajan has given this meditation as an antidote for anxiety. I have a friend in Virginia who says it has changed her life and she teaches it to anyone and everyone. During any period of recovery there are always a lot of unknown factors. When will the pain stop? When will I be able to return to work or begin training again? It is normal to be anxious and a little impatient with the process of healing. This meditation will help calm and balance you. This meditation is beneficial for all three regions of the back. Time: Three to thirty -one minutes. Sit in a cross-legged sitting position, or preferably on the knees and heels. Arms are held up overhead with the upper arms hugging the ears. Fingers are clasped together with the index fingers point straight up and palms touching. Recite the word “Sat” as you pull the navel point up and in. Release this muscular contraction) and recite the word “Nam.” Concentrate the word “Sat” at the navel point, concentrate the word “Nam” at the brow point. Let the breath regulate itself. Eyes are closed and focused at the brow point. Inhale deeply, hold the breath, and apply root lock. Exhale and repeat two more times. Relax. This is the king of all Kundalini Yoga kriyas (a kriya is a concentrated form of yoga that has a very specific and powerful effect). It safely raises the Kundalini energy (Kundalini energy is the innate energy that resides within a person and is responsible for all creative and conscious growth in an individual). It balances the chakras (energy centers), rejuvenates the sexual system and helps the body and brain to recover from toxicity and memory loss due to drug abuse. It is good for removing energy imbalances in the three lower chakras and, as a result, is beneficial for problems in the lower back. Sit in any position and keep your spine straight as possible. You can chant the mantra or listen to it. Chant from the heart center and actively give over your pain, fears, self-limitations, and dis-easiness to the healing vibrations. Inhale and hold the breath briefly and then sit quietly and very still with relaxed breathing. Absorb the reverberation of the healing field of energy that you have created. This is the mantra/meditation to use when you are feeling overwhelmed, afraid, or in pain. It has saved me countless times and I rely on the mantra and the healing field of energy that it creates. This is the mantra on the CD and is the mantra in the background of the video “Heal Your Back Now!” Play the CD in this system as much as possible during your recovery process. I play it on my computer CD player as I work during the day! It is also recommended that you consciously chant or meditate on the mantra for some time daily. In addition to the CD in this system there are other audio tapes and renditions available of this mantra from Ancient Healing Ways, 39 Shady Lane Espanola NM 87532 505 753 0763. Their recordings with this mantra are coded as follows: SEV002, CT071, CRM001, KSK002, WGK021, SKK013, MOL005, MAS035, MOL006, CRM101, GDK001, GSK024. You can also order this mantra/ music from Sprit Voyage at 888 735 4800 or at their website on the World Wide Web at http://www.spiritvoyagemusic.com Request the music with the mantra Guru Guru Wahe Guru Ram Das Guru. This meditation is beneficial to all three regions of the back. Time: No time limitations are associated with this meditation. Physical Position: Sit in any position you like. Instruction: This is a silent meditation that involves feeling or visualizing energy movement along the path of the “Golden Cord.” This is the energetic pathway and connection between the pituitary and pineal gland in the head. You mentally bring the Sa ( and subsequently the Ta, Na, and Ma) sound in through the top center of your head. You then project the extra “a” sound out your brow point. The “a” is pronounced like a short “u” as in “cut.” In your imagination, feel or see the energy moving. Breath is relaxed. When the mind wanders, you can bring it back to mantra and the movement of the energy. Inhale deeply, briefly hold, then relax. 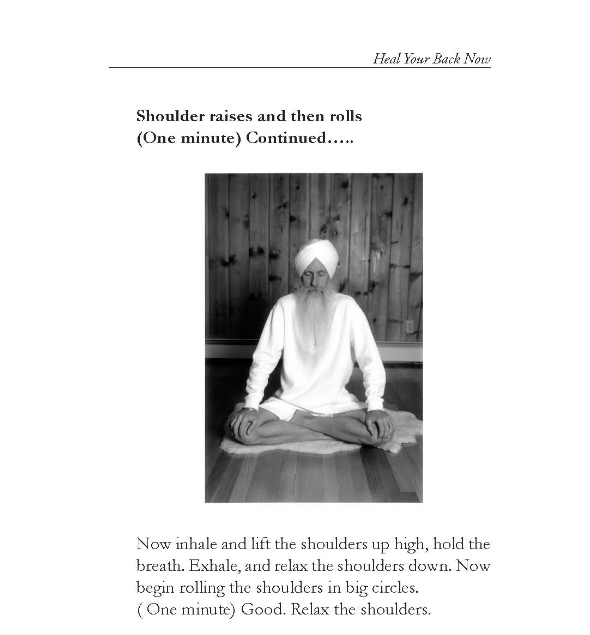 This meditation was taught to me personally by the Master of Kundalini Yoga, Yogi Bhajan. At the time he said that it carried the power of the splitting of the atom. My experience is that it is a wonderful clearing meditation by itself or after another meditation when you are in that relaxed and still state of being, and you want to maintain that loving and peaceful space. This meditation is beneficial for all regions of the back. Mantra I Am I Am. Time Eleven to thirty-one minutes. Sit comfortably cross legged on the floor or sit upright in chair with both your feet flat on the ground. You will be using your left hand for the movement while the right hand stays relaxed at the right knee or in the lap. Using the left hand, place it front of the heart center about six inches in front of the chest. As you say the mantra “I Am” out loud, bring the hand, with the palm facing your chest, in closer to the chest ( about four inches away). On the second “I Am,” move the hand away from the chest until it is about twelve inches out from the chest. Inhale through the nose and then bring the hand back to the beginning position of being six inches in front of the chest. Continue this cycle. At the end: Inhale deeply, briefly hold, then relax. This meditation will bring you a relaxed and magnetic awareness of the your heart center and an identity that exists in the present moment. It takes care of the mental self-questioning of identity through a loop process of self answering. You say “I Am” and if a subconscious question arises ( I am what?) you answer to your own self “I Am.” This self- education can be very healing. This meditation is very beneficial for the middle region of the back.